The collect and readings for Easter may be found here. The appointed gospel is Matthew 28:1-10. When our son was younger he would sometimes call out in the middle of the night. “Dad! I heard something” or “I saw something.” I would go to his room, turn on the light, and together we would look around; under the bed, in the closet, behind the door. After a little while one of us would say, “There’s nothing here,” and he would climb back into bed knowing all is well. That is the Easter message. There’s nothing here! Do not be afraid. All is well! That story about my son is not just a story about a little boy. It’s the human story. It’s the story of life lived in fear of darkness and death. It is a story, I suspect, each of knows well. We fear for ourselves and we fear for those we love. Something is there. Something more powerful than ourselves. We are right. But it’s not what we think. 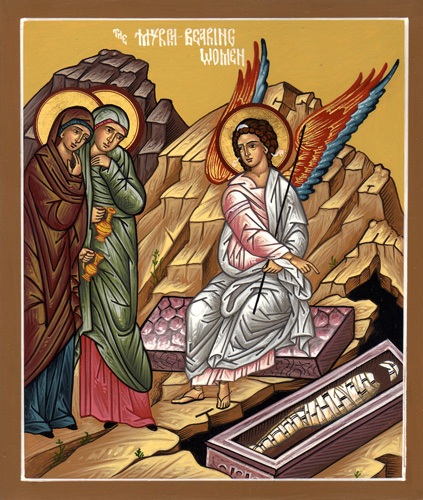 Two women, both named Mary, go to see the tomb. They know something is there. They saw it all. They watched the crucifixion. They saw Jesus die. They saw Joseph take Jesus’ body, wrap it in a cloth, and put it in the tomb. They saw him roll a great stone to the door of the tomb. They were there, sitting opposite the tomb. They know what to expect as they go to the tomb. Death, fear, pain, loss, sorrow. A tortured body beginning to decay. But a new sunrise and the big bang of a great earthquake signal the dawn of a new creation; one in which death no longer rules. God, not death, will have the first, the final, and every word in between. Too often we think resurrection is about what happens to us after we die. We limit resurrection to nothing more than a promise of life after death. The power and gift of resurrection are not so much in what happens after death but right here, now, today. Perhaps we should worry less about whether there is life after death and more about whether there is life before death. The joy of Easter is not only that God has raised Christ from the dead. Easter joy is also about the possibility and the promise that, regardless of what our lives are like now, new life is available to each one of us here and now. God has raised Christ from the dead and we are now free to claim his life as our own. What matters most about Easter is not the empty tomb but what we do tomorrow, the day after, and the day after that. How will we now live differently? Jesus did not die and rise again so that we might continue life as usual. If this new life and freedom do not change us we might as well put the stone back over the tomb. If we leave here today and don’t think about Easter again until next year then we’ve entirely missed the gift. Our lives are the evidence of resurrection, or not. We are no longer prisoners to the power or fear of sin, darkness, and death. We don’t have to be worried about how all of this is going to turn out. Life is eternal. Love is immortal. We are free to live. We are free to love. The end of the resurrection story is the beginning of our life. Christ is risen. So live fully alive now. Why wait until after death? Darkness has become light. Sin has been forgiven. The tomb has become the womb of new creation. There is no more death. Life is everywhere. “Go quickly,” the angel tell us. There’s nothing here. Run for your life! Christ is risen. You will see him! Thank you, Mike, for the thoughts that “the resurrection” is not a finite event, but that it continues on and on with and in each one of us. Hallelujah! Next Next post: Easter: A Noun or a Verb?